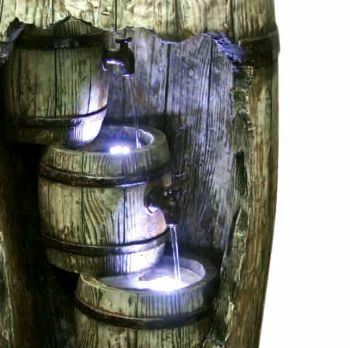 The Cascading Barrels is a contemporary interpretation of a traditional garden water feature with the strategically placed LED lighting making it particularly attractive at night time. Its compact, fully self-contained design makes it ideal for installation in any garden, patio or indoor area. The concealed reservoir contains the supplied underwater pump, which transports the water through a hidden hose to the upper tap, cascading from the top barrel through to the middle and bottom barrels This water cascade is completely self-contained and, as the water is continuously recycled, there is no requirement for a mains water connection. This highly detailed feature is constructed from a blend of weather resistant poly-resin and stone, offering a highly detailed traditional weathered wood effect finish but without the weight and costs normally associated with similar cast stone fountains and features. The Cascading Barrels water feature will add a relaxing visual attraction and gentle water sound in any setting. 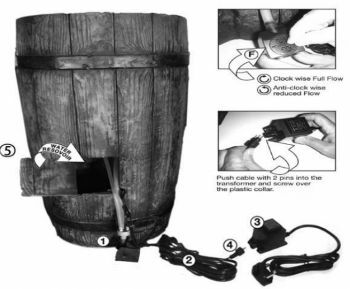 The kit is supplied with pump, LED Lights, low voltage transformer and 10 metres of cable and is very easy to install. Just add water for a soothing experience. 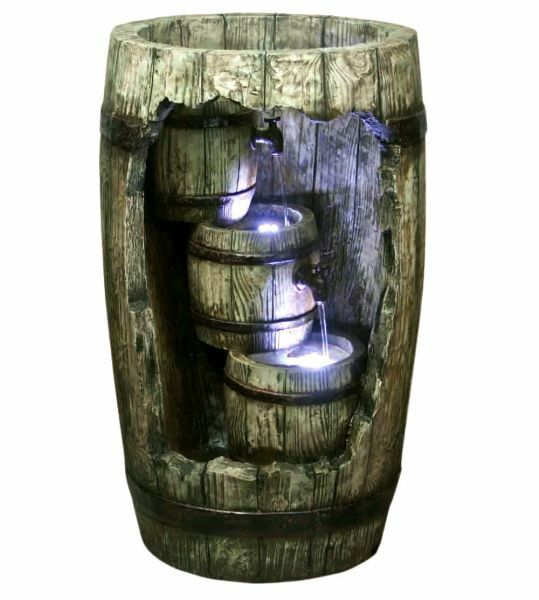 Cascading Barrels Dimensions: H785mm (31") x W470mm (18.5") x D420mm (16.5"). Weight Approx 17.5kg (38.5lbs).